Aim: To analyse how age-related losses in crystalline lens transmittance and pupillary area affect circadian photoreception and compare the circadian performance of phakic and pseudophakic individuals of the same age. Methods: The spectral sensitivity of circadian photoreception peaks in the blue part of the spectrum at approximately 460 nm. Photosensitive retinal ganglion cells send unconscious information about environmental illumination to non-visual brain centres including the human body’s master biological clock in the suprachiasmatic nuclei. This information permits human physiology to be optimised and aligned with geophysical day–night cycles using neural and hormonal messengers including melatonin. Age-related transmittance spectra of crystalline lenses and photopic pupil diameter are used with the spectral sensitivity of melatonin suppression and the transmittance spectra of intraocular lenses (IOLs) to analyse how ageing and IOL chromophores affect circadian photoreception. Results: Ageing increases crystalline lens light absorption and decreases pupil area resulting in progressive loss of circadian photoreception. A 10-year-old child has circadian photoreception 10-fold greater than a 95-year-old phakic adult. A 45-year-old adult retains only half the circadian photoreception of early youth. Pseudophakia improves circadian photoreception at all ages, particularly with UV-only blocking IOLs which transmit blue wavelengths optimal for non-visual photoreception. Conclusions: Non-visual retinal ganglion photoreceptor responses to bright, properly timed light exposures help assure effective circadian photoentrainment and optimal diurnal physiological processes. Circadian photoreception can persist in visually blind individuals if retinal ganglion cell photoreceptors and their suprachiasmatic connections are intact. Retinal illumination decreases with ageing due to pupillary miosis and reduced crystalline lens light transmission especially of short wavelengths. Inadequate environmental light and/or ganglion photoreception can cause circadian disruption, increasing the risk of insomnia, depression, numerous systemic disorders and possibly early mortality. Artificial lighting is dimmer and less blue-weighted than natural daylight, contributing to age-related losses in unconscious circadian photoreception. Optimal intraocular lens design should consider the spectral requirements of both conscious and unconscious retinal photoreception. Figure 1 Spectral sensitivity of photopic, scotopic and circadian (melatonin suppression) photoreception.5 7 Peak sensitivities of circadian, scotopic and photopic photoreception are 460 nm (blue), 506 nm (green) and 555 nm (green-yellow), respectively. Spectral absorptance is shown for 30D blue blocking (AcrySof SN60AT, Alcon Laboratories, Fort Worth, TX) and UV-only blocking (ClariFlex, Advanced Medical Optics, Santa Ana, CA) intraocular lenses (IOLs).8 The area between the two IOL curves is the violet, blue and green light blocked in comparison with a UV-only blocking IOL. Figure 2 Light levels in contemporary and natural environments39 54–57 and also in phototherapy for seasonal affective disorder, which is typically 2500 lux for 2 h/day or 10 000 lux for 30 min/day.44 Illuminances are given in units of photopic lux. Photopic lux accurately describe the effectiveness of a particular light exposure for overall cone photoreception, which has a peak sensitivity at 555 nm in the green–yellow part of the spectrum (cf, fig 1). 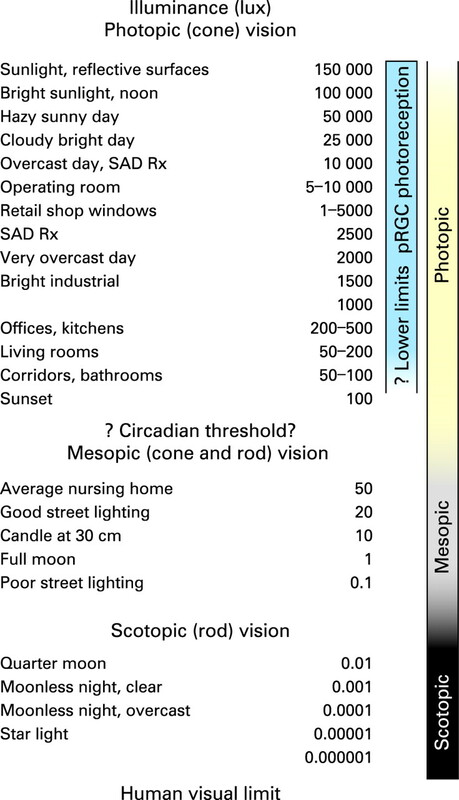 A standard circadian lux unit is needed10 40 but has not been adopted yet for comparing the effectiveness of different light exposures for circadian photoreception, which has peak sensitivity at 460 nm in the blue part of the spectrum (cf, fig 1). Brighter, longer, bluer light exposures are most efficient for retinal ganglion mediated effects including melatonin suppression,5 6 photoentrainment,40 thermoregulation,17 improved nocturnal sleep quality,41–43 heart-rate variability,17 treatment of non-seasonal44 or seasonal depression,45 enhanced mood/well-being,46 47 alertness,17 18 46 48 cognition,19 46 49 reaction time, performance and vigilance.18 48 The crystalline lens transmits progressively less visible light and particularly less blue light as it ages.50 51 Senescent miosis also progressively reduces retinal illumination.52 53 Deficient circadian photoreception results in significant neurobiological morbidity. We therefore examined how ageing and cataract surgery potentially affect the light available for circadian photoreception. Figure 2 is a compilation of published environmental and therapeutic light levels.39 44 54–57 Typical indoor and outdoor illuminances were confirmed with standard light meters (Models 403125 and EA30s, Extech Instruments Corporation, Waltham, MA). 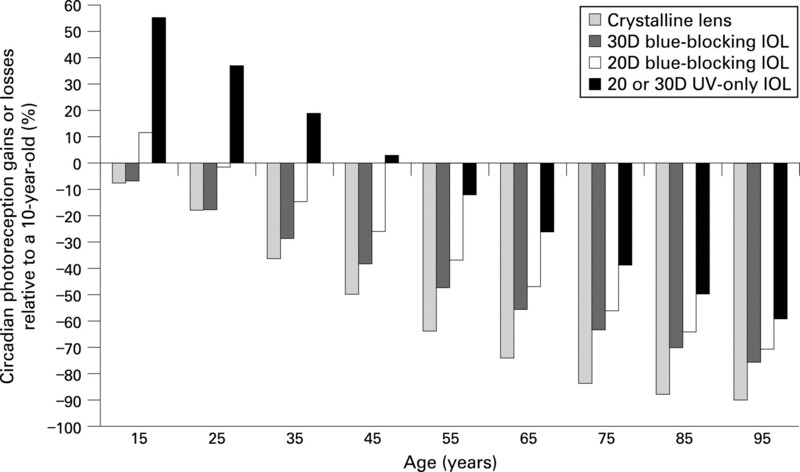 The age-related decline in retinal illumination in fig 3 was calculated by multiplying human crystalline lens transmittance at different ages51 with photopic pupil area for those ages.53 Results are presented relative to a 10-year-old eye. Pupil-weighted spectral retinal illumination was multiplied wavelength by wavelength with melatonin suppression sensitivity5 58 between 350 and 700 nm to determine how ageing affects circadian photoreception for an isoquantal light source. Resultant areas under the curve for 10 years of age and 15 through 95 years of age represent relative circadian illumination and are presented in table 1. Similar calculations are shown in fig 4 but with the spectral transmittance of 20 and 30-dioptre blue-blocking (AcrySof SN60AT, Alcon Laboratories, Fort Worth, TX) or UV-only blocking (ClariFlex, Advanced Medical Optics, Santa Ana) intraocular lenses8 (IOLs) used in addition to that of crystalline lenses (cf, fig 1). Figure 3 Age-related losses in retinal illumination due to decreasing crystalline lens light transmission and pupil area. Percentage losses per decade are reasonably uniform and most prominent at shorter violet (400–440 nm) and blue (440–500 nm) wavelengths. Figure 4 Age-related losses or gains in circadian photoreception relative to a 10-year-old eye for phakic eyes, for 20 and 30D blue-blocking (AcrySof SN60AT, Alcon Laboratories, Fort Worth, TX) and for UV-only blocking intraocular lenses (IOLs) regardless of dioptric power (ClariFlex, Advanced Medical Optics, Santa Ana, CA). Cataract extraction with IOL implantation produces significant gains over phakic eyes, particularly with UV-only blocking IOLs that do not filter out shorter wavelengths vital for non-visual photoreception. Figure 3 shows how losses in crystalline lens transmittance and pupil area due to ageing produce progressive decreases in pupil-weighted spectral retinal illumination. Percentage losses are reasonably uniform with each passing decade. 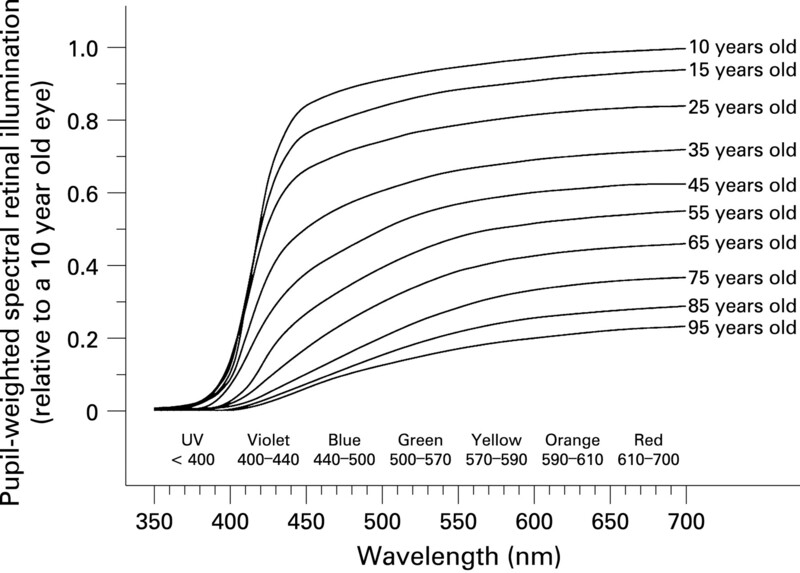 They are most prominent at shorter violet (400–440 nm) and blue (440–500 nm) wavelengths. Table 1 presents relative effectiveness of circadian photoreception at different ages. By 45 years of age, crystalline lens yellowing and pupillary miosis reduces circadian photoreception to roughly half that of a 10-year-old. People in their eighth and ninth decades retain only 10% of a 10-year-old’s circadian photoreception, so they need 10 times more light for equivalent circadian photoreception under similar illumination, in agreement with Charman’s findings.58 Deficits will be underestimates if pRGC populations decline with ageing as do those of non-photoreceptive retinal ganglion cells.59 Additional reductions in pRGC photoreception may occur if ocular light transmission is decreased further by factors such as ethnicity, iris pigmentation,60 reduced corneal clarity, cataract or sunglass usage. Figure 4 illustrates age-related losses or gains in circadian photoreception relative to a 10-year-old eye. Cataract extraction with implantation of a UV-only blocking IOL results in significant gains, with performances in older adults comparable with phakic individuals up to four decades younger. People under 50 years of age with UV-only blocking IOLs attain better circadian photoreception than in their youth. 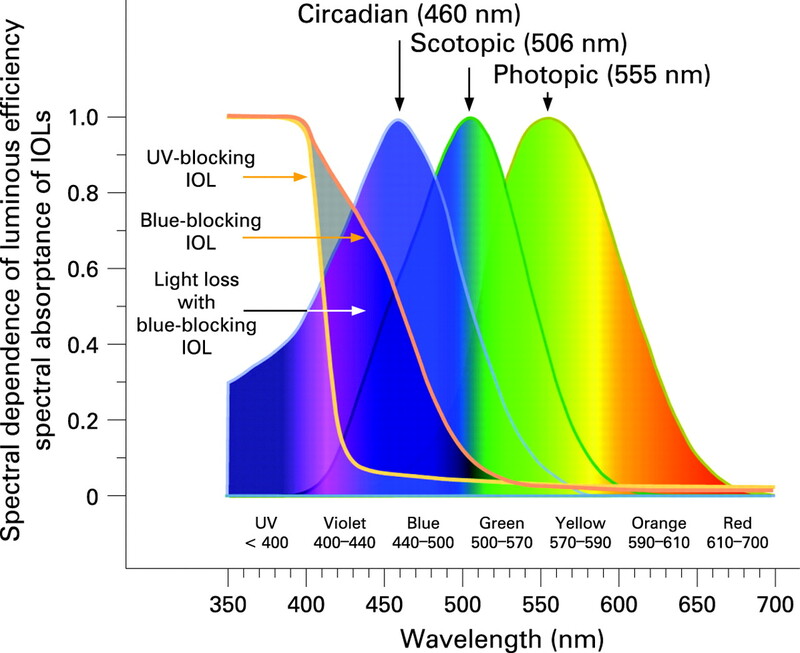 UV-only blocking IOLs provide circadian photoreception at any given age roughly 15–20 years younger than blue-blocking IOLs, depending on the latter’s dioptric power. There is little current information on the susceptibility of retinal ganglion photoreceptors to ocular disease. Retinitis pigmentosa may affect ganglion as well as rod and cone photoreceptors because by 50 years of age, 95% of people with retinitis pigmentosa experience intermittent insomnia, daytime sleepiness and reduced alertness.61 62 Glaucoma is associated with ganglion cell losses, but pRGCs were resistant to ocular hypertension in one experimental rodent study.63 Cortical blindness would not affect light-mediated pRGC functions so patients should retain normal sleep patterns with appropriate light exposure and potentially benefit from light therapy for coincident depression even though visually blind. Conversely, whiplash injury,64 tetraplegia,30 autonomic neuropathy or other conditions affecting the retinohypothalamic tract, SCN-pineal connections or intermediate nuclei can impair or abolish specific circadian rhythms. SCN cycle at fixed, inherited, individually specific periods that typically differ from 24 h and average 24.2 h in humans.9 If environmental timing cues are inadequate or absent,36 65 SCN cycle daily at their own intrinsic period independent of geophysical day–night cycles. Repetitive cycling without daily resetting is termed free-running.9 In free-running, the phase of physiological cycles progressively deviates from and then returns to that of environmental day–night cycles over days or months. Daily light exposures necessary for non-visual photoreception depend on numerous intrinsic13 60 79 80 and extrinsic factors.5 33–35 For example, older women even with dilated pupils are insensitive to blue light exposures sufficient to suppress melatonin significantly in younger women, demonstrating that age-related crystalline lens yellowing reduces circadian photoreception.81 As shown in fig 4, cataract surgery provides older adults with more youthful circadian photoreception. The eye’s critical role in good health has become increasingly evident. Unconscious retinal ganglion photoreceptor responses to bright, properly timed light exposures ensure optimal circadian rhythms, photoentrainment and other neurobiological responses. Inadequate environmental light and/or ganglion photoreception can cause circadian disruption, increasing the risk of insomnia, depression and numerous systemic disorders. Complete blindness involving both conscious vision and unconscious, non-visual photoreception should be differentiated from visual blindness affecting only the conscious perception of light. Visually blind patients should be encouraged to get sufficient light, while completely blind individuals typically benefit from melatonin therapy.
. Melanopsin-expressing ganglion cells in primate retina signal colour and irradiance and project to the LGN. Nature 2005;433:749–54.
. Phototransduction by retinal ganglion cells that set the circadian clock. Science 2002;295:1070–3.
. A novel human opsin in the inner retina. J Neurosci 2000;20:600–5.
. Strange vision: ganglion cells as circadian photoreceptors. Trends Neurosci 2003;26:314–20.
. An action spectrum for melatonin suppression: evidence for a novel non-rod, non-cone photoreceptor system in humans. J Physiol 2001;535:261–7.
. Action spectrum for melatonin regulation in humans: evidence for a novel circadian photoreceptor. J Neurosci 2001;21:6405–12.
. Color science: concepts and methods, quantitative data and formulae. New York: Wiley, 1982.
. Violet and blue light blocking intraocular lenses: photoprotection versus photoreception. Br J Ophthalmol 2006;90:784–92.
. Neuronal input pathways to the brain’s biological clock and their functional significance. Adv Anat Embryol Cell Biol 2006;182:1–71.
. Photic regulation of melatonin in humans: ocular and neural signal transduction. J Biol Rhythms 1997;12:537–46.
. A model of phototransduction by the human circadian system. Brain Res Brain Res Rev 2005;50:213–28.
. Adaptation of human pineal melatonin suppression by recent photic history. J Clin Endocrinol Metab 2004;89:3610–14.
. Less exposure to daily ambient light in winter increases sensitivity of melatonin to light suppression. Chronobiol Int 2007;24:31–43.
. The eye as metronome of the body. Surv Ophthalmol 2002;47:17–26.
. Chapter 20: Organization of circadian functions: interaction with the body. Prog Brain Res 2006;153:341–60.
. Clinical aspects of human circadian rhythms. J Biol Rhythms 2005;20:375–86.
. High sensitivity of human melatonin, alertness, thermoregulation, and heart rate to short wavelength light. J Clin Endocrinol Metab 2005;90:1311–16.
. Short-wavelength sensitivity for the direct effects of light on alertness, vigilance, and the waking electroencephalogram in humans. Sleep 2006;29:161–8.
. Wavelength-dependent modulation of brain responses to a working memory task by daytime light exposure. Cereb Cortex 2007;17:2788–95.
. Effect of sunlight and season on serotonin turnover in the brain. Lancet 2002;360:1840–2.
. Circadian and sleep-dependent regulation of hormone release in humans. Recent Prog Horm Res 1999;54:97–130; discussion 130–2.
. Properties, entrainment, and physiological functions of mammalian peripheral oscillators. J Biol Rhythms 2006;21:494–506.
. The mammalian circadian timing system: from gene expression to physiology. Chromosoma 2004;113:103–12.
. Circadian regulation of sleep in mammals: role of the suprachiasmatic nucleus. Brain Res Brain Res Rev 2005;49:429–54.
. Functional plasticity of the circadian timing system in old age: light exposure. Prog Brain Res 2002;138:205–31.
. Living by the clock: the circadian pacemaker in older people. Ageing Res Rev 2006;5:33–51.
. A clockwork web: circadian timing in brain and periphery, in health and disease. Nat Rev Neurosci 2003;4:649–61.
. Melatonin: Nature’s most versatile biological signal? Febs J 2006;273:2813–38.
. A physiologically based mathematical model of melatonin including ocular light suppression and interactions with the circadian pacemaker. J Pineal Res 2007;43:294–304.
. Absence of detectable melatonin and preservation of cortisol and thyrotropin rhythms in tetraplegia. J Clin Endocrinol Metab 2000;85:2189–96.
. Nocturnal melatonin synthesis: how to stop it. Endocrinology 2007;148:1473–4.
. Human melatonin regulation is not mediated by the three cone photopic visual system. J Clin Endocrinol Metab 2001;86:433–6.
. Human melatonin suppression by light is intensity dependent. J Pineal Res 1989;6:149–56.
. The effect of light on the human circadian pacemaker. Ciba Found Symp 1995;183:254–90; discussion 290–302.
. Optimization of light and melatonin to phase-shift human circadian rhythms. J Neuroendocrinol 2003;15:438–41.
. Effects of light on human circadian rhythms. Reprod Nutr Dev 1999;39:295–304.
. Green thunderstorms observed. Bull Am Meteorol Soc 1996;77:2889–97.
. Does architectural lighting contribute to breast cancer? J Carcinog 2006;5:20.
. Spectral, irradiance, and temporal aspects of natural and artificial light. Ann N Y Acad Sci 1985;453:28–54.
. High sensitivity of the human circadian melatonin rhythm to resetting by short wavelength light. J Clin Endocrinol Metab 2003;88:4502–5.
. Light treatment for sleep disorders: consensus report. IV. Sleep phase and duration disturbances. J Biol Rhythms 1995;10:135–47.
. Diminished melatonin secretion in the elderly caused by insufficient environmental illumination. J Clin Endocrinol Metab 2001;86:129–34.
. Blue light and the circadian clock. Br J Ophthalmol 2004;88:1353.
. The efficacy of light therapy in the treatment of mood disorders: a review and meta-analysis of the evidence. Am J Psychiatry 2005;162:656–62.
. Light therapy for seasonal affective disorder with blue narrow-band light-emitting diodes (LEDs). Biol Psychiatry 2006;59:502–7.
. The effect of high correlated colour temperature office lighting on employee wellbeing and work performance. J Circadian Rhythms 2007;5:2.
. Bright light therapy of subsyndromal seasonal affective disorder in the workplace: morning vs. afternoon exposure. Acta Psychiatr Scand 2001;103:267–74.
. Daytime exposure to bright light, as compared to dim light, decreases sleepiness and improves psychomotor vigilance performance. Sleep 2003;26:695–700.
. Blue light improves cognitive performance. J Neural Transm 2007;14:457–60.
. Transmission of the ocular media. Invest Ophthalmol 1962;1:776–83.
. The direct spectral transmittance of the excised human lens as a function of age (FDA 785345 0090 RA). Washington, DC: US Food and Drug Administration, 1991.
. Influence of age on visual functions in humans. Bull Acad R Med Belg 1971;11:527–78.
. Pupil location under mesopic, photopic, and pharmacologically dilated conditions. Invest Ophthalmol Vis Sci 2002;43:2508–12.
. Strategic study of household energy and greenhouse issues. In: Environment Australia. Canberra: Australian Greenhouse Office, 1998:61–3.
. Illumination levels in nursing home patients: effects on sleep and activity rhythms. J Sleep Res 2000;9:373–9.
. Introduction to color imaging science. Cambridge: Cambridge University Press, 2005.
. Light and exercise and melatonin production in women. Am J Epidemiol 2005;162:1114–22.
. Age, lens transmittance, and the possible effects of light on melatonin suppression. Ophthalmic Physiol Opt 2003;23:181–7.
. Retinal ganglion cells in Alzheimer’s disease and aging. Ann Neurol 1993;33:248–57.
. Influence of eye colors of Caucasians and Asians on suppression of melatonin secretion by light. Am J Physiol Regul Integr Comp Physiol 2007.
. Decreased sleep quality in patients suffering from retinitis pigmentosa. J Sleep Res 2001;10:159–64.
. Sleep and daytime sleepiness in retinitis pigmentosa patients. J Sleep Res 2001;10:329–35.
. Melanopsin-expressing retinal ganglion cells are more injury-resistant in a chronic ocular hypertension model. Invest Ophthalmol Vis Sci 2006;47:2951–8.
. Whiplash injury may deregulate the biological clock. J Neurol Neurosurg Psychiatry 2005;76:1044.
. Sleep, performance, circadian rhythms, and light-dark cycles during two space shuttle flights. Am J Physiol Regul Integr Comp Physiol 2001;281:1647–64R.
. Relationship between melatonin rhythms and visual loss in the blind. J Clin Endocrinol Metab 1997;82:3763–70.
. Suppression of melatonin secretion in some blind patients by exposure to bright light. N Engl J Med 1995;332:6–11.
. Relationship between napping and melatonin in the blind. J Biol Rhythms 1997;12:16–25.
. Melatonin entrains free-running blind people according to a physiological dose–response curve. Chronobiol Int 2005;22:1093–106.
. Capturing the circadian rhythms of free-running blind people with 0.5 mg melatonin. Brain Res 2001;918:96–100.
. Age-related eye disease, visual impairment, and survival: the Beaver Dam Eye Study. Arch Ophthalmol 2006;124:243–9.
. Glaucoma and survival: the National Health Interview Survey 1986–1994. Ophthalmology 2003;110:1476–83.
. Vision impairment predicts 5 year mortality. Br J Ophthalmol 2001;85:322–6.
. Visual impairment, age-related cataract, and mortality. Arch Ophthalmol 2001;119:1186–90.
. Mixed lens opacities and subsequent mortality. Arch Ophthalmol 2000;118:393–7.
. Vision impairment predicts five-year mortality. Trans Am Ophthalmol Soc 2000;98:91–6; discussion 96–9.
. Human circadian phase in 12:12 h, 200: <8 lux and 1000: <8 lux light–dark cycles, without scheduled sleep or activity. Neurosci Lett 2002;329:41–4.
. Entrainment of the human circadian pacemaker to longer-than-24-h days. Proc Natl Acad Sci U S A 2007;104:9081–6.
. Melatonin sensitivity to dim white light in affective disorders. Neuropsychopharmacology 1999;21:408–13.
. Entrainment of the human circadian system by light. J Biol Rhythms 2005;20:326–38.
. Light-induced melatonin suppression: age-related reduction in response to short wavelength light. Exp Gerontol 2005;40:237–42.
. Sleeping problems at 78 degrees north: the Svalbard Study. Acta Psychiatr Scand 1997;95:44–8.
. Dimensional measurement of seasonal variation in mood and behavior. Psychiatry Res 1991;39:269–84.
. Seasonal variation of depression and other moods: a longitudinal approach. J Biol Rhythms 2000;15:344–50.
. Prevalence of winter depression in Denmark. Acta Psychiatr Scand 1998;97:1–4.
. Epidemiology, etiology, and natural treatment of seasonal affective disorder. Altern Med Rev 2005;10:5–13.
. Low illumination experienced by San Diego adults: association with atypical depressive symptoms. Biol Psychiatry 1994;35:403–7.
. Illuminating the impact of habitual behaviors in depression. Chronobiol Int 2005;22:279–97.
. Restoration of detectable melatonin after entrainment to a 24-hour schedule in a “free-running” man. Psychoneuroendocrinology 1997;22:39–52.
. Transient short free running circadian rhythm in a case of aneurysm near the suprachiasmatic nuclei. J Neurol Neurosurg Psychiatry 2005;76:1178–80.
. Determinants of sleep quality in the healthy aged: the role of physical, psychological, circadian and naturalistic light variables. Age Ageing 2004;33:159–65.
. Circadian and sleep disturbances in the elderly. Exp Gerontol 2000;35:1229–37.
. Prevalence and comorbidity of insomnia and effect on functioning in elderly populations. J Am Geriatr Soc 2005;53:264–71S.
. Insomnia as a risk factor for onset of depression in the elderly. Behav Sleep Med 2006;4:104–13.
. Chronomic community screening reveals about 31% depression, elevated blood pressure and infradian vascular rhythm alteration. Biomed Pharmacother 2004;58(1 Suppl):48–55S.
. Depressive symptoms and risk of mortality in frail, community-living elderly persons. Am J Geriatr Psychiatry 2003;11:561–7.
. The extent and impact of insomnia as a public health problem. J Clin Psychiatry Primary Care Companion 2002;4:8–12.
. Depression in the elderly: new concepts and therapeutic approaches. Aging Clin Exp Res 2004;16:176–89.
. Depression, stress and immunological activation: the role of cytokines in depressive disorders. Life Sci 1998;62:583–606.
. Sleep loss: a novel risk factor for insulin resistance and Type 2 diabetes. J Appl Physiol 2005;99:2008–19.
. Depression duration but not age predicts hippocampal volume loss in medically healthy women with recurrent major depression. J Neurosci 1999;19:5034–43.
. Changes in the immune system in depression and dementia: causal or coincidental effects? Dialogues Clin Neurosci 2006;8:163–74.
. Sleep complaints predict coronary artery disease mortality in males: a 12-year follow-up study of a middle-aged Swedish population. J Intern Med 2002;251:207–16.
. Human melatonin production decreases with age. J Pineal Res 1986;3:379–88.
. Do plasma melatonin concentrations decline with age? Am J Med 1999;107:432–6.
. Cancer chronomics III. Chronomics for cancer, aging, melatonin and experimental therapeutics researchers. J Exp Ther Oncol 2006;6:73–84.
. The dark side of light at night: physiological, epidemiological, and ecological consequences. J Pineal Res 2007;43:215–24.
. Natural light exposure of young adults. Physiol Behav 1986;38:571–4.
. Seasonal and diurnal patterns of human illumination under natural conditions. Chronobiol Int 1998;15:59–70.
. Exposure to light in healthy elderly subjects and Alzheimer’s patients. Physiol Behav 1988;42:141–4.
. Variations in circadian rhythms of activity, sleep, and light exposure related to dementia in nursing-home patients. Sleep 1997;20:18–23.
. The development of sleep in persons undergoing cataract surgery. Arch Gerontol Geriatr 2002;35:179–87.
. Sleep and sleepiness 1 and 9 months after cataract surgery. Arch Gerontol Geriatr 2004;38:69–75.
. Laser damage to retinal ganglion cells: the effect on circadian rhythms. J Diabetes Complications 2006;20:184–7.
. Decreasing retinal photocoagulation damage: principles and techniques. Semin Ophthalmol 1999;14:200–9. Competing interests: PLT has received travel grants from Advanced Medical Optics, Incorporated. MAM serves as a consultant for Advanced Medical Optics, Iridex and Ocular Instruments Corporations. © Turner et al 2008 This is an open-access article distributed under the terms of the Creative Commons Attribution License, which permits unrestricted use, distribution, and reproduction in any medium, provided the original work is properly cited.